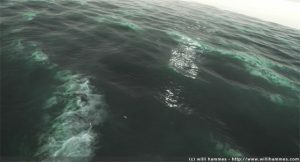 This 3D Studio Max plugin adds a new geometry object which generates a statistically generated ocean wave suface. It allows you to set parameters like wind direction and strength, required detail, … to control the aperance of the sea surface. This is basically the same “Tessendorf” method developed for my “H2Ocean” demo but adapted for non real time use. It is also the method used to generate the ocean surface in movies like “Titanic”. See the included readme.html in the archive for details on how to use and install this plugin. The archive also contains a sample scene. Note: I only tested this on max 6 (the only version I have a licence for) but user reports seem to indiate it works on other versions too. Update: Now also supports Max 9 32 and 64 bit.